Brazil and France have explored each other's geographical and cultural landscapes for more than five hundred years. The Brazilian je ne sais quoi has captivated the French from their first encounter, and the ingenuity à francesa of French artistic and scholarly movements has intrigued Brazilians in kind. Ongoing Brazil-France interactions have resulted in some of the richest cultural exchanges between Europe and Latin America. In Cultural Exchanges between Brazil and France, leading international scholars evaluate these reciprocal transnational explorations, from the earliest French interventions in Brazil in the sixteenth century to the growing mutual influence that the nations have exerted on one another in the twenty-first century. 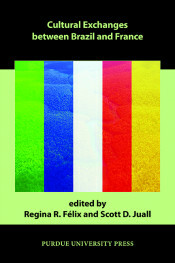 Original interdisciplinary essays examine cross-cultural interactions and collaborations in the social sciences, intellectual history, the press, literature, cinema, plastic arts, architecture, cartography, and sport. The comparative cultural method used in these analyses deepens the collective treatment of crucial junctures in the long history of often harmonious, but also sometimes ambivalent and occasionally contentious, encounters between Brazil and France. Regina R. Félix teaches Portuguese language and Brazilian, International, and Women’s Studies’ courses at the University of North Carolina Wilmington. Her research in Brazilian culture, film, and literature focuses on the gender, race, and class structures of power relations in national, global, and postcolonial frameworks. She is the author of Sedução e Heroísmo—Imaginação de Mulher, which examines women’s discursive entrée in the Brazilian nineteenth-century male-dominated literary field.